Last week, car internet blew up over eBay listings that purported to show two rare Plymouth Superbirds that had been “hidden from the public eye for 35 years.” It’s the sort of thing we report on all the time—barn finds are interesting and neat and fun. And then a law firm sent us a letter. The law firm in question CC’d us on a cease-and-desist letter sent to the seller accusing him of overcooking that claim. Then I got on the phone with the seller as well as the guy he originally bought the Superbirds from, both of whom had wildly different versions of how everything went down. Now, the Superbird story that caught everyone’s attention is a lot weirder than it initially seemed. Let’s back up to the original story. Two Plymouth Superbirds were posted to eBay last Monday and were sold Thursday for $150,200 and $160,600, which is not surprising for a car coveted by many and made in such few numbers. Attached to the cars is an extraordinary story relayed by the seller, Richard Amistadi, who describes how he bought the cars from a man later identified as Stephen Thum. 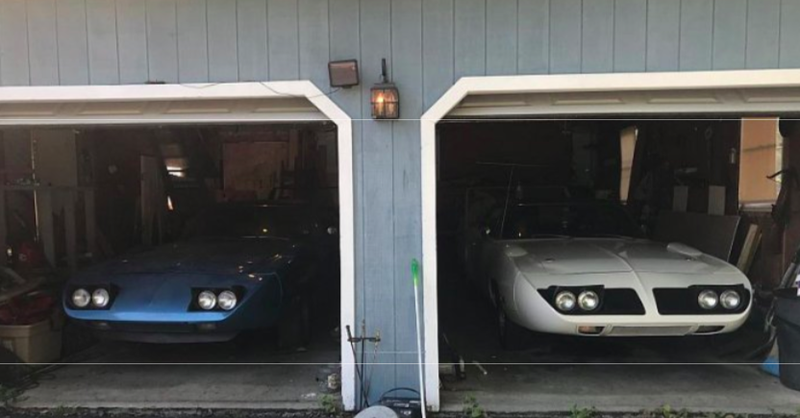 Amistadi says he met Thum after the former bought a different Superbird in August, at which point Thum told Amistadi that he owned two Superbirds and was looking to sell. A few days after that, Amistadi saw the cars in person for the first time. That’s where their accounts begin to diverge. In part at stake is a term Amistadi put in the title of his eBay listings: “BARN FIND,” which to most people means a car that’s been sitting in dry storage for some period of time, usually forgotten and not in great shape but able to be brought back from the brink. It’s a dream to unexpectedly “uncover” a classic car and restore it to greatness. Amistadi’s eBay listings play perfectly to this appeal. The problem is that Thum says that the cars aren’t barn finds at all, in particular the white one, which he had running as late as last year, and also took to local car shows over the years. Amistadi, for his part, says that he stands by what he wrote, and that everything he put in the eBay listings are things that Thum told him at the time of the sale. Amistadi says that Thum is backtracking now because he feels “embarrassed” by the price that he sold Amistadi the cars. Both men declined to divulge the exact price, but Amistadi said that it was “over $100,000” each, with Amistadi saying he hoped he would get at least $125,000 each for the cars on resale. Thum doesn’t dispute most of the details in Amistadi’s eBay listings, but he was upset enough to get a lawyer involved, sending a five-page C&D letter to Amistadi on Friday. He said he was motivated by a sincere belief that the listings, particularly the parts about the cars being in “dry storage” for 35 years, were deceptive. The letter also said they amounted to defamation under Maine law. Amistadi said he’s tried to be as transparent as he can be. Thum says the bidding had gotten out of control. A mechanic told him that it would take $50,000 or $60,000 to get the blue Superbird restored alone. Thum sold them to Amistadi after concluding, at age 56, that it was “time to downsize,” as he owns five other cars. Since he got the legal threat, Amistadi said he called eBay, who assured him that the auction wouldn’t end. “It’s just a sad situation,” Amistadi said.